It's hard to believe it's been 25 years since we met Henry Hill on the big screen and instantly fell in love. I'm not sure why we became so fascinated, but maybe it had something to do with guns, violence and a bunch of wise guys who thought they ruled the streets. Whatever the reason, we were captivated by the portrayal of the mafia and now, 25 years later, the original Academy Award-winning, Goodfellas is being released on 4K Blu-ray. Henry (Ray Liotta; Hannibal) was a two-bit, half Italian, half Irish kid living in New York City who made his way up in the mob. By the time he was 21, he was in the Lucchese crime family inner circle, though never fully accepted. He helped with robberies and occasionally shook people down and beat them up. He was a trusted member of Paulie Cicero's (Paul Sorvino; Romeo + Juliet) crew. Everything seemed great for Henry, even after serving some time in jail and he was happy with his life married to Karen Friedman (Lorraine Bracco; The Sopranos), while sleeping around on the side. Things seemed to sort of unravel when he started dealing cocaine and ingesting almost as much as he sold. When he finally got caught, he and Karen turned state's evidence and testified against Paulie and James Burke (Robert DeNiro; Casino), bringing down a number of members of the mob and entering witness protection. Goodfellas made Ray Liotta a household name and really launched his acting career. His portrayal of Hill was a beautiful blend of Italian/Irish Charm mixed with cold and calculating gangster. Along with Joe Pesci (My Cousin Vinny), DeNiro and Sorvino were perfect as mobsters, waiving their riches around and making other people fear for their lives. Written and Directed by Martin Scorsese (The Wolf of Wall Street) the film had a winning cast, terrific screenplay, and a director who moved the pace, while keeping audiences engaged. The 2160p video quality is excellent, though there were times in the beginning of the film that I felt as though the picture was a little wavy, almost like when you can see the steam rising off the blacktop on a hot summer day. The DTS-HD Master 5.1 audio is clear and makes good use of the limited soundtrack and recording of the 1990's. For those who love gangster/mob-related films, this one is a winner and a classic. Based on a true story and adapted from Nicholas Pileggi's novel Wiseguy, it's the perfect gift for any member of your family that loves a good mob movie. 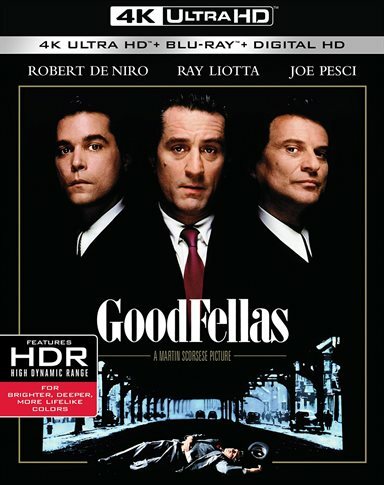 Download Goodfellas from the iTunes Store in Digial HD. For more information about Goodfellas visit the FlickDirect Movie Database.